I talked to Dane today and he gave me a lot of points for my predictions; probably more than I deserve. It has now been 6 months, and before I make another batch of iPad 3 predictions, I want to follow up on my last set. Prediction1: “Tomorrow, the stock will take a hit.” Correct. Shares were down three dollars the following day, but the stock ended the week up $10 from the dip. Prediction 2: The press event. Fail. Apple didn’t get to their holiday lineup announcement until October 4, the day before Steve Jobs actually passed away. Prediction 3: “The stock will climb for the rest of the year.” Correct. There were some pretty crazy swings and Apple’s highest price wasn’t at the end of the year. However, it ended 2011 with an impressive price of $405, up 7.6% from the day of Steve’s resignation. Prediction 4: iPhone 5 timing. Fail. Timing was wrong. The iPhone 5 was actually called the 4S and didn’t get released until October 14. Prediction 5: “3 million during opening weekend.” Correct. They did sell 3 million. Then they sold 1 million more. Prediction 6: Best Holiday quarter ever. Right in the ways that matter. The record were broken, in all categories except iPod. But the huge EPS beat makes up for it. Prediction 7: New iPad. Almost nailed it. I was close enough to the 6 month mark to be satisfied. Now the question is, how stupid will it make it look competing tablets. Stay tuned for the answer to that. Bonus Prediction 8: AAPL at $550 in Aug 2012. Undershot. We will have to wait and see what happens, but as of this writing, Apple is at $533 and has been on a relentless rise. I doubt it will be lower than $550 by August. But They have made it to most valuable company. Apple’s best marketing decision – ever. David sent me an article that I almost completely disagreed with. It was about 10 marketing mistakes that Apple has made over the years. Maybe in some other post, I will describe why I disagree with his specific claims. This post, however, is not about the worst marketing decisions, but the best. I think there is one decision that can be credited more than any other for the rise of Apple in the last few years. 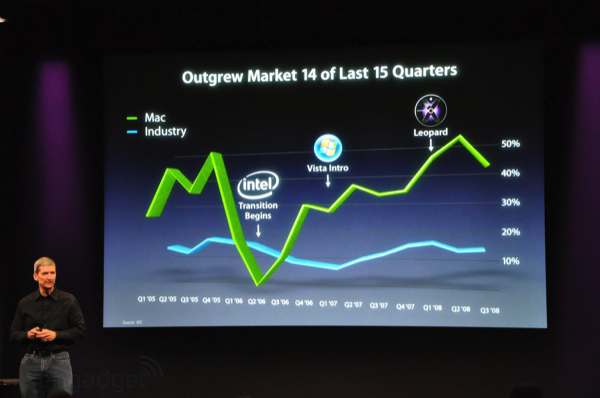 In an earlier post, I showed a graph of Mac OS X’s growth speeding up. I think that one of the main factors that contributed to the growing popularity of the Mac is the iPod. I will illustrate this supposition with two badly superimposed graphs. The bar chart represents Mac unit sales, and the line represents iPod unit sales. iPhone has been an undeniable success, with it’s speed of growth being even faster than iPod’s. 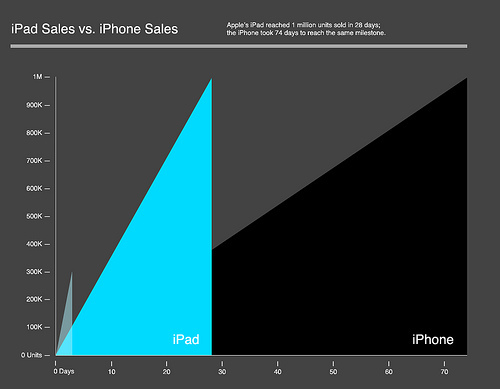 And it looks like iPad is moving even faster (so far) than iPhone. The learning curve for operating system switching is a significant barrier to entry for most users. Enough so that my wife doesn’t even want to learn, despite my obsession interest in Apple products. That barrier kept Mac in a niche for years and years. iPod gave people a taste of what Apple products are like, without the learning curve. The iPod embodied what Apple has always tried to create with their products: an experience that is pleasant with a product that doesn’t get in the way of the task at hand. Many decisions about the iPod were made to help it be successful, such as good product design, easy music uploads, the introduction of the store etc. While these are all important features and benefits, there was one marketing decision that was more important than all of these factors. In 2000, when I would listen to my Sony Discman, it would sit in my bag or my pocket. For that matter, when anybody listens to portable music, the device sits hidden in their pocket. How is anyone suppose to hear about this amazing device if it hangs out in your pants? The single best marketing decision that Apple ever made was to make their iPod earbuds white. Unlike other mobile music players, you knew when someone was listening to an iPod. The iPod was a fabulous product, and very worth talking about, but the white headphone helped people to know how many people were using it. This product momentum is what started it all off. iPod led to iPhone which led to iPad, all of which are leading to more converts to the world of Apple. And once they have you, you can’t get away. When I was growing up, Brian and I used to play computer games at his house because he had two computers networked together so we could play each other. We’d play Wolfenstien, Duke Nukem and Descent on his super fast 100 Mhz machines until way past when I should have been home. Amidst the violence and explosions, we talked about computers. Brian was a PCs, I was a Mac.We argued just like a billion other people have all around the world – Mac is better, PC is better. My arguments were good, but Brian’s was simple. He was right. While the Mac did have some incredible games, there were way more for PC, and I would never convince Brian that Mac was better because it just had more games. It’s true of applications too. As soon as Windows became the OS leader, it was forever after the leader in applications. People used Windows because of the applications. It became a point of differentiation that Microsoft didn’t actually create; the market created it around them. It caused a cycle: people develop software for the platform that gets used, and the more software there is for that platform, the more attractive it is to users. Windows thrived on this cycle for years. Then the internet changed what is important about a computer. Now for the riddle: “How is windows like the iPhone?” You guessed it, the answer is the same as Brian’s: “It just has more games.” Well, ok, not just games, but apps. Tons of apps. Like, more than Window’s Mobile. Today, developers have the choice of developing software for the iPhone or other similar gadgets. While iPhone does not (yet) have the largest market share for smartphones, it has the highest usage rates among its competitors. And developers don’t care if people are buying the phones; they care if people are buying their apps, and it is more than clear that if you want apps, you want an iPhone. The market has already given iPhone Eventually, the same cycle of more users – more apps – more users that has fed Microsoft for so many years might actually lead to Apple taking over this market. Time will tell. Speaking of time going by – after Brian and I graduated from high school, he went to college and studied computer science. He bought a Mac and loves it. He does, however, still have Vista machine so he can play Unreal Tournament when his wife goes to bed.